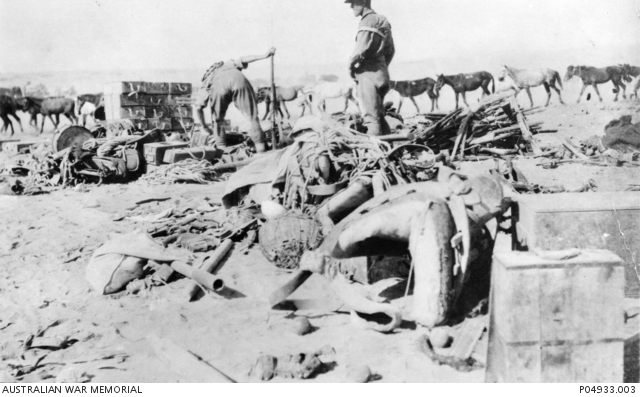 Members of the 12th Light Horse survey damaged items and captured Turkish equipment from the Battle of Beersheba, Palestine 31 October 1917. Image courtesy Australian War Memorial. Allied and Turkish forces clash in the Battle of Beersheba in Palestine. The 4th Australian Light Horse Brigade leads their famous mounted charge, capturing the Turkish stronghold. The month of October 1917 would prove to be the costliest month of WWI in terms of Australian casualties, with 40,498 men killed, wounded or missing. 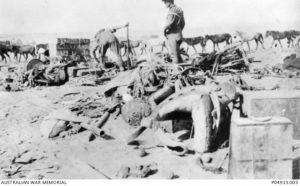 The year 1917 would be the worst year of the war for Australia with more than 21,000 dead – one-third of all Australians killed in the four-year conflict. This entry was posted on October 31st, 2017.